If the Reichsburg Cochem isn't one of these, it should be. "Last Chance Not To Go Near The Castle!" This is the article for the trope Haunted Castle. For the Castlevania game of the same name, click here. On a foggy mountain peak in a spooky land looms the Haunted Castle — and who knows what manner of creature lurks within its walls? It could be some sort of vampire, Frankenstein's Monster, a Mad Scientist, the Wolf Man, or even Bugs Bunny. Or maybe all of them at once. The protagonist will be driven to the castle by a thunderstorm, running out of gas, or by his own curiosity. In the valley below, the villagers will have warned the hero against spending the night in the castle, but he presses on into the night. His beautiful bride will question his decision, but will reluctantly accompany him. Once the couple have arrived at the castle, the monster will take a liking for the bride. Perhaps she resembles some long-lost love of the monster, or he desires her for some mad experiment. It will also typically be Always Night, with the sun never rising until the evil is vanquished. Expect Dramatic Thunder, Grave Clouds with a Chance of Rain, Ominous Fog, Cobweb of Disuse, Falling Chandelier of Doom, and your typical Dark And Stormy Night. In a North American setting, instead of a haunted castle, the Haunted House will be the monster's home, since actual castles are in short supply in the United States and Canada. They are plentiful in Transylvania. Count Chocula, Frankenberry, and Boo Berry live in a haunted castle, or more accurately, they haunt a castle. Supplemental material says that the castle belongs to Chocula, the other two just live there. The Castle of Illusions in Digimon V-Tamer 01, "haunted" by the lingering data of monsters improperly deleted. It comes up in Gundam spin-off Gundam Build Fighters Try: one of the fights in the main tournament arc takes place in one such haunted castle. Berserk: Every castle Guts comes across is either filled with some monstrosity or just filled with assholes. One Piece: Thiller Bark, the whole island is one big spooky castle. Castle McDuck in Disney's Donald Duck and Uncle Scrooge comics: When first introduced in Carl Barks' "The Old Castle's Secret," it was purportedly haunted by the ghost of Sir Quackly McDuck, who sealed himself in its walls along with a chest full of treasure. In Don Rosa's comics, it's apparently haunted by every member of the McDuck clan, who watch over their descendants and help scare off enemies; Sir Quackly is the one who shows himself the most often. There was also a "Scooby-Doo" Hoax launched by their rival clan the Whiskervilles involving a ghostly hound. Rueben Rueben, from Zip Comics, stumbled on a haunted castle with benevolent ghosts who gave him powers. Doctor Doom's castle in Latvaria. The only monster is the human monster of Doctor Doom. Baufort Castle in the Johan and Peewit comic book story "The War of the Seven Springs" (and its Animated Adaptation counterpart "The Haunted Castle") is haunted by its ancestor Aldebert Baufort, because he had caused the seven springs surrounding his castle to dry up due to his selfish desire for more wine to drink, and thus is Barred from the Afterlife until the seven springs are restored and a true Baufort descendant who carries the family seal comes to reclaim the castle. Played straight in the Underworld (2003) movies with Kate Beckinsale. 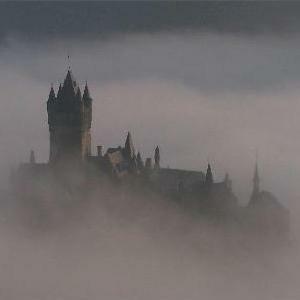 A gothic mansion and a haunted castle both make appearances. The ancient Glourie castle in the The Ghost Goes West. The Rocky Horror Picture Show is an Affectionate Parody of this trope, the movie is mostly set in one that turns out to be a spaceship. The ensemble comedy High Spirits (1988) was set in a haunted castle. Van Helsing plays this straight but also kind of lampshades it since the whole movie is a deliberate mash-up/tribute to Universal Horror Classics. "Manos" The Hands of Fate played this exact trope, except they couldn't get a castle, so they used a smallish and rather boring house. Castle of Blood depicts Edgar Allan Poe being challenged to reveal the inspiration of his stories. Big mistake—it leads to a night in a haunted castle. The film claims to be based on a story of the real Poe but nothing he wrote in our world really fits the bill. The movie was remade in 1971, titled Web of the Spider and was allegedly based on Poe's famous story Night of the Living Dead. Uh, yeah. Many of Vincent Price's movies were set in haunted (or supposedly haunted) castles, The Pit and the Pendulum probably being the best example. The castle Hurog is this. However, what most people think is the ghost is actually more something like a Genius Loci, and is not there out of his own free will, he was magically bound to the castle, to make it Powered by a Forsaken Child. Despite all this, Oreg is quite friendly to the inhabitants, that is, unless they slap the mute daughter of the family. It is never mentioned what he did to the person who did that, but it is mentioned that she never visited again. Older Than Radio: The Story of the Youth Who Went Forth to Learn What Fear Was features a youngster spending three nights in a haunted castle to try and learn what fear is. Walpole's The Castle of Otranto (1764) initially gave rise to this trope in popular culture, not to mention to Gothic Fiction in general. Bram Stoker's Dracula, of course. Dracula greets Jonathan Harker: "Welcome to my house! Enter freely and of your own will!" Played with in the Discworld novel Carpe Jugulum, where the ancestral Uberwaldean home of the Magpyrs is actually called Dontgonearthe Castle, and the Old Count would advertise it as if it were a tourist trap using Reverse Psychology ("Last Chance to Not Go Near The Castle"). It worked terrifically; people would come in for MILES just so they could Notgonearthe castle. And when, every few decades, the vampire there rose again ( and was quickly quelled, of course), it just added to the interest... and the local economy. It helps even more that there's something with the roads that causes all traveling coaches to break a wheel as they near it. Present in Christopher Stasheff's novel The Warlock's Companion; it's the location where half the story takes place. The other half is flashbacks, including one that plays with the trope by referring to an ancestor a few centuries ago who, seeing that haunted houses were becoming all the rage, but owning only a fairly recent mansion, instructed the house butler/majordomo to go out and buy an ancestral ghost from somewhere. In James Thurber's The 13 Clocks, the Duke finds his castle haunted by the children he locked in the tower: that is, he hears their laughter, and children's balls come bouncing down the stairs. Cold as he is, he finds this more horrifying than the ordinary sort of ghosts. The neo-Gothic Wyrdhurst Hall in Aunt Dimity Beats the Devil. It comes complete with local villagers who tell visitors the place is haunted. Harrenhal has this reputation, partially because the Targaryens used dragons to roast the castle's holders alive centuries ago, and partially because most of the people who hold the castle end up experiencing acute misfortune. Janos Slynt got sent up to join the Night's Watch, Amory Lorch got thrown in the bear pit when the castle was taken, Vargo Hoat had his limbs chopped off and fed to him by Gregor Clegane, and so on: and, these are just the newest. There are tales of the ghost of Harren the Black and his sons roaming the castle, looking like charred corpses. Not to mention whatever House Lothston as a whole managed to do while living in it to still get used as scary stories to get children across the Riverlands into staying indoors when it starts to get dark for fear of what could come out of the castle. They've been extinct for decades by the start of the series, but it left a mark. The Nightfort of the Wall has had a decidedly nasty reputation for ages. Partially for which it was eventually abandoned centuries ago. The Rat Cook, Brave Danny Flint, the Night's King and his Other Queen, the Seventy-Nine Sentinels... Many horror stories of blood, betrayal and ghostly goings on are attached to this castle. Either rightly or wrongly. The magic Black Gate it contains, however, isn't just a story. And, that's pretty creepy enough. Harry Potter: Hogwarts Castle is a unique form of this trope: the castle is indeed haunted by several ghosts, but most are perfectly nice (well, except Peeves, but he's a pest rather than an actual threat, and not even really a ghost but a poltergeist; the Bloody Baron is pretty terrifying but harmless), and the castle is, of course, also a school. Most of the ghosts just hang around and give advice when asked, but one of them is actually teaching classes, and no-one's sure if he's even noticed he died. The Reynard Cycle: The palace of Carduel has this reputation due to all the horrible things that happened there over the years: Mass poisonings, cannibalism both accidental and deliberate, people being entombed alive behind the walls, etc., etc. Even Madam Corte, a born skeptic, is convinced the place is haunted. Septimus Heap: The Palace is inhabited by mostly benign ghosts and has a generally run-down appearance, also because the Heap family is too small for it. A few pop up in the Middle-earth works of J. R. R. Tolkien: Minas Morgul and Dol Guldur in the Third Age (both literally haunted, being the lairs of the Ringwraiths and the Necromancer respectively) and in the First Age, when Sauron captures Minas Tirith (no, not the one in Gondor) on Tol Sirion, and turns it into Tol-in-Gaurhoth (the Isle of Werewolves) with a similar reputation for unquiet souls. And of course Barud-dur by definition. The eponymous building in Sonic The Hedgehog In Castle Robotnik is a purpose built one so Robotnik can shoot a film. Was apparently constructed in under 4 months. The Riverlands are home to Harrenhal, a castle built by the Ironborn during their occupation of the region. Though now a ruin, it remains the largest castle built in Westeros, but the day it was completed, the Targaryens invaded and roasted the Ironborn royal family inside. The Histories and Lore bonus material explains that since then every family to hold it has met with misfortune. This holds mostly true even in the present day: Janos Slynt was banished and later executed, Locke had his neck broken by a Bran-controlled Hodor, Gregor Clegane was gravely wounded (it is unclear if the show's version was brought back from the dead as Ser Robert Strong apparently was or merely returned from the brink), Robb Stark, Tywin Lannister, Roose Bolton, and Littlefinger were murdered. The Nightfort, where Bran and company pass the Wall, is supposedly haunted by the Rat Cook, who violated Sacred Hospitality. Subverted and played for laughs in an episode of the Canadian reality series Kenny vs. Spenny. The two title characters have a competition to see who can stay inside an abandoned house the longest without getting scared. Kenny (the member of the duo that always cheats) tries a number of tactics to scare his friend Spenny, who's easily manipulated. In the end, Kenny is spooked out of the house by a loud noise, which he believed to be a ghost. It was actually a construction crane that fell on the house, making Spenny win the competition. Also played for laughs in the Buffy the Vampire Slayer episode "Buffy vs. Dracula:"
Riley: I've lived in Sunnydale for a couple years now. Know what I never noticed before? Riley: A big, honkin' castle. Star Trek: The Original Series episode "Catspaw". 3-D Ultra Pinball: Creep Night takes place in and around a castle that's infested with ghosts, goblins, and other supernatural creatures. In The Gamer's Alliance, the palace of Daisuke Hyuga in Yamato is covered by a dark forest and becomes haunted after Lord Daisuke, in despair after having lost his wife Matami in a raider attack, makes a blood pact with the demon Yurius. Grave Academy is a Forum/RPG that centers on a school for monsters which is based in such a castle. Warhammer has several, mostly concentrated in Sylvania. Dungeons & Dragons has too many examples to list, but the Ravenloft campaign is setting is especially full of them, due to its Gothic horror inspirations. Most notable is Castle Ravenloft, after which the setting is named. Mysterium involves investigators going to one to solve the mystery of its haunting. Doris Castle, home of the titular countess Raymonda from the ballet Raymonda, is a normal, lived in castle that happens to be haunted by a helpful, if strict, family ghost called the White Lady. Appears in the Scooby-Doo scene from the former ride, The Funtastic World of Hanna-Barbera. Is the main setting of the Busch Gardens attraction, The Curse of Darkastle. The Dutch theme park Efteling has a haunted castle called Spookslot as one of its oldest attractions. Fighting your way through such castles is the very premise of the Castlevania series. In fact, Haunted Castle is the actual title of one of the arcade games in the series. Keith's castle in Shadow Hearts is both a straight example and a subversion. It is haunted, as is only appropriate for a castle owned by a vampire, but the owner himself is a very nice guy; all the real trouble in the area is being caused by the mayor of nearby Bistriz. World of Warcraft has two haunted castles, Shadowfang Keep and Karazhan. Groups can assault these castles to kill their Evil Overlord. Also, the Forsaken hometown of the Undercity is the dungeon of a Haunted Castle. But other than that they're okay people. To be fair, the city was razed by the faction that made them rather than the splinter group that lives there now. Another haunted castle in the game in Icecrown Citadel which outclasses all the others in size. Foe Mansion in La Tale, complete with Frankenstein-esque monsters and ghosts. Kuon features a cursed medieval Japanese mansion. Soldier's Peak, the former headquarters of the Grey Warden Order in Ferelden as seen in the Warden's Keep DLC expansion for Dragon Age: Origins. It's an abandoned fortress inhabited by roaming undead, demons, ghosts and a centuries-old blood mage, trying desperately to hold back a demonic invasion from the Fade. The Adamant Fortress mentioned in Asunder, a Grey Warden outpost built into the side of the Abyssal Rift, a chasm believed to lead right down to the Deep Roads. After being abandoned by the Wardens, it fell under the control of the Tranquil Pharamond, who's experiments accidentally tore the Veil, leading to every building but the Keep being burnt to the ground, the inhabitants killed and their corpses possessed by demons. Mundus's castle in the first Devil May Cry. Dante's not spooked easily, but the place is filled with eerie contraptions and horrific demons. Fatal Frame features Himuro Mansion for the first game and the Mansion of Sleep for the third. Both are big. Both are spooky. Both are designed to make sure you never come out again, dead or alive. Quest for Glory IV has Castle Borgov, home to ghosts, vampires, ogres, and Toby. Ted: "So typical of the castles I've visited in Europe. A beautiful facade disguising ordinary stone." The ruins of New Londo in Dark Souls, the remains of a once-great city flooded to seal away the Darkwraiths. It's now filled with ghosts, who are quite nasty,requiring the player to either be cursed or use special weapons to hurt them. Almia Castle from Pokémon Ranger: Shadows of Almia is completely devoid of human life and crawling with ghost and psychic-type Pokémon. It's also covered in ice. Hang Castle in Sonic Heroes is filled with pumpkin-headed ghosts and robotic wizards and witches and sprawls out as far as the eye can see. The following stage, Mystic Mansion, is set on the inside, with the final area on the roof at dawn, having survived the many traps within. The reason Sonic is here is because he's spotted a Chaos Emerald in the castle. Osohe Castle in MOTHER 3. The Covenant Manor from Clive Barker's Undying. Sylvain Castle in Terranigma has an Acid Pool outside, and inside has skeletons, Giant Spiders, Undead Knights and some grim records of its former inhabitants. Nosferatu: The Wrath Of Malachi: It's not so much "haunted" as it is "run by, inhabited by, infested with, and patrolled by undead monsters and demons" but same difference. Cainhurst Castle in Bloodborne. It's a creepy frozen castle in the snowy mountains. It's infested with ghosts and crazed servants and lorded over by the long-dead Logarius, a scythe-wielding skeleton. You even get there by way of a black carriage without a driver after finding an invitation — addressed specifically to your player character — on a dead body in the local clinic. Resident Evil 4 has a castle run by mutant cultist. Creepy Castle from Donkey Kong 64, complete with Bedsheet Ghosts and Skeleton Kremlings. The Adventures Of Square has one in the underground of cheesy yellow moon. It has many ghost enemies that use magic attacks, pools of blood, a monsterous eldrich ghost and the warp gate. While no actual ghosts are present, Hollow Bastion in Kingdom Hearts I counts as this. A strange, supernatural castle abandoned by the original inhabitants in a state of disrepair/mid-repair, mysterious and still-working Magitek, floating platforms, an ocean that flows upward, and is being used as a Evil Tower of Ominousness by Maleficent and her crew of villains. It does not help that the world is essentially ground-zero for the Heartless infestation that has been destroying the universe. Girl Genius has Castle Heterodyne. The ruined steampunk castle may not actually be haunted, but it's stuffed full of deathtraps, and its broken artificial intelligence tends to kill the people who enter, and/or press-gangs them into repairing it. In Schwarz Kreuz Harker, whose training in being a vampire probably comes from Hammer Horrors, sets his base in a suitably ruined one. Ghosts always seemed to love that old haunted castle on the outskirts of town, in The Ghost Busters. Subverted in many Looney Tunes cartoons. Two of Van Beuren Studios cartoons are set in haunted castles full of skeletons and ghosts respectively—one of their Tom and Jerry shorts "Wot A Night", and one of their Felix the Cat cartoons "Bold King Cole". Bender's uncle Vlad's castle in the Futurama episode "The Honking". Near the village of Thermostadt, it was "haunted" by holograms of his dead ancestors. Richard Tyler in The Pagemaster has to go through Dr. Jekyll's 'spooky' mansion (complete with dark clouds, lightning, bats, a full moon, and a kind of gravestone in the front saying that it belongs to him). The Beast's castle in Beauty and the Beast. As the Beast gradually gets nicer, the action takes us further and further into the section of the castle that has pretty neo-classical architecture, until the curse is cured at the end and the whole building is like that. Castle Wyvern in Gargoyles has this reputation, although we never see any ghosts within the castle itself. Though the nearby caverns do contain the ghosts of Hakon and the Captain of the Guard. The Jackie Chan Adventures episode "Chi of the Vampire" is set in a place like this. Jackie, Jade, Uncle, and Tohru visit an abandoned castle located somewhere in the mountains of China, hoping to buy and sell the antiques it contains. But they later find out the hard way that this wasn't really such a good deal; as they were not warned that a sleeping Jiangshi resided here. Mr Krbec and his Animals: Castle Kulikov is haunted by its previous owner Duke Ruprecht. He's mischievous and troublesome, but fairly harmless and occasionally even helpful. He scared away most of previous castellans who had been employed to work there, but he happily coexists with Mr Krbec and his animals. Ruprecht's tricks provide some additional entertainment to tourists as he can make his portrait sway; he can move objects like books or clothes; he happily delivers his mysterious evil laugh; he often appears to others as a white or occasionally see-through ghost and he can even temporarily gain "body and colour". He's also happy to scare away major jerks who deserve it. Given that castles' whole purpose was to provide strongholds for military authority, the abundance of ghost stories which arise from their typically bloody histories is hardly a surprise. Windsor Castle is supposed to be haunted by the sad and shabby ghost of King George III who spent his last years there chatting up the shrubbery under the impression it was brother monarchs and being tormented by the doctors trying to cure him. And the ghost of Queen Elizabeth I still briskly walks the gallery she built for exercise on rainy days which is now the library. The Tower of London is even more haunted for obvious reasons. The murdered princes Edward V and Richard Duke of York are seen playing around the White Tower, the headless ghost of Anne Boleyn stalks the halls terrifying the Yeoman Warders and so on. Scotland is full of them. Most Scottish castles seem to have at least one ghost, though three standouts are Edinburgh, Glamis and Fyvie. Here is a very incomplete list. The Kremlin is no less fun, being perhaps the one castle in Europe with the bloodiest history. The ghost of Ivan the Terrible is said to appear before terrible catastrophes; two last alleged sightings are before Red October and just before WWII. Other recognizable ghosts in these stories are of Pseudo-Demetrius (last sighting: just before the fall of the Union), the ill-fated Tsar Boris Godunov, Nikolay Yezhov (the Peoples' Commissar of NKVD, who enacted the Great Purge of 1937-1939), Fanny Kaplan (Lenin's assassin) and Lenin himself. The oldest ghost allegedly seen in the Kremlin is the medieval prince Ivan the Moneybag, and the youngest is Marshal of the Union Sergey Akhromeev, who committed suicide there during the fall of the Union (1991). The Tuileries palace in Paris according to legend was haunted by "the Little Red Man", the ghost of a butcher whom Queen Catherine of Medici (spouse of Henry II) had murdered because he knew some of her dark secrets. As he died he cursed those responsible for his death and vowed to return. Which he is said to have done many times, usually just before deaths significant to the royal family, such as before Catherine's death, the assassination of Henry IV, and the deaths of Cardinal Mazarin and Louis XIV. Marie Antoinette is said to have seen him a few times a few days before the storming of the palace by revolutionaries in 1792, and later he supposedly made a habit of visiting Napoleon Bonaparte before important turning points, the last time in 1815 before he set off for the Waterloo campaign. The Count of Artois and his brother Louis XVIII are said to have seen the Little Red Man shortly before Louis' death in 1824, and in 1870 Empress Eugénie saw him pointing to the way out as she fled from the palace on her way into exile in England. The last time when the Little Red Man is said to have been seen was when the Communards set fire to the Tuileries Palace in 1871. After the palace burned down it was demolished and the Little Red Man was never seen again. The Hohenzollern family, especially their main branch, the royal house of Prussia, was haunted by the White Lady (Weiße Frau), who would often appear shortly before the death of a king or important family member. Mostly she haunted the royal palace in Berlin (the Stadtschloss), however in some cases she also is reported to have been seen in other castles and palaces belonging to the Hohenzollerns, e. g. in Bayreuth, where she allegedly caused Napoleon a sleepless night in 1812. Bhangarh. Notorious for being India's most haunted place, it was said to have been cursed by a magician in the 1600s. In fact, even the government is aware of the situation, as there are signs warning trespassers of legal prosecution if caught entering during nighttime. Over the years, there have been rumors of spirits roaming around the area and locals witnessing eerie sounds and lights coming from the abandoned fort.